Olight S2 950 Lumen Flashlight Review – Today’s Best Everyday Carry Light? The flashlight is a very important yet underrated tool. Even from a self-defense standpoint, few things are more valuable than a powerful light when you’re in a dark situation. A flashlight is a tool, and an important one at the moment you happen to need it. The trick is finding the RIGHT ONE for you. 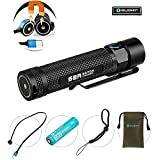 We live in amazing times… The are so many great flashlights to choose from today, with all kinds of features, often found for a great value. They come in every shape, size, color, form factor, etc, etc. Better is one of those interesting words… it all depends on your preference and the right tool for the job. For the past 6 moths, my EDC flashlight has been the ultra-portable Olight S1. It’s a tiny CR123 light (about the size of your thumb) which puts out some impressive light: 500 lumens. Durable, waterproof, good ergonomics, good materials, beautiful design, nice fit and finish. What I didn’t love about the Olight S1: with my light use of a few minutes a day (yes, often on high lol), it would burn through a CR123 battery every week or so. Rechargeable CR123’s aren’t even worth it for the S1… I’d get 3 days per charge tops. So while I really liked that little flashlight, and there’s no excuse to not always have it with you, given how small it is… I was hoping Olight would come up with a big brother of sorts. Something better for my usage patterns. Dammit, I want a hight quality, powerful light that I can count on for more than a few days… even when I use full power regularly. Sure enough, they came out with the Olight S2. About twice the length of the S1, the new S2 is powered by a single 18650 rechargeable battery. It can also take 2 CR123’s with the provided padding sleeve (since the rechargeable 18650 is thicker than a CR123). Pro tip: That means you can run with the 18650 and keep the plastic sleeve with both CR123’s in your pocket EDC kit or daily grab bag as backup. The Olight S2 has all the features I loved about the S1, but amped up! Same excellent construction, good ergonomics, nice knurling on the body for easy but comfortable grip. 950 Lumens. Did I Mention 950 Lumens? In case I forgot to mention… 950 lumens!! In the dark, that’s a lot of light to deliver on target instantly. From a light as wide as your thumb and twice as long as your thumb. Damn impressive. My only complaint is it takes 2 rapid clicks on the soft clicky button to activate this Turbo mode and deliver 950 lumens. In a self-defense situation, a single click would be preferable. TIR Lens: A Usable Wall Of Light – No More Light Circles!!! What I like most about the Olight S2 (and the smaller Olight S1) is the TIR (total internal reflection) lens approach instead of the far more common reflector. This TIR lens design puts out a full, usable wall of light. That means no more of the traditional light artifacts with a bright spot in the middle, brighter overlaying circles, etc, that are so common with reflectors. Nope, this thing puts out a solid wall of usable light. FINALLY! Damn hard to go back from this tech. So I don’t lol. But how’s the light? Most excellent. Same “wall of light” reflector design, but one major difference… a max of 950 lumens. When you flip that on in the dark, it’s A LOT of light from a small flashlight. What I didn’t expect was how I like the larger S2 so much better than the S1. I LIKE having 950 lumens at the quick push of a button. And surprisingly I prefer the longer body, as it allows me a better grip… it fills my hand better so it’s easier to hold. Many “tactical lights” have a tail clicky button, meaning you can’t tail stand them. That’s unfortunate. The ability to put a flashlight down on its tail and light up a room is important, especially for an everyday carry light. Not only that, but the S2 (like the S1) has a strong magnet in the base, meaning you can instantly mount it on any metal surface for directed light. Think: a car hood, inside the trunk, on a metal wall, etc. Again, flexibility is key for an everyday carry light. Pro tip: don’t leave the light “on” in the trunk after doing whatever you’re doing in there. That will totally drain the battery and take a while to get it charged again. Or so I hear. The Olight S2 also features a super low-power mode, literally half-lumen, often referred to as “moonlight mode”. That’s very important in situations where you need a very tiny bit of light to make your way or find something, without giving away your position and without losing your night vision. Practically speaking, the difference between “no light” and a tiny amount of light is actually huge. Moonlight mode is also crucial in everyday stealth operations, like putting the pups to bed without waking your wife up with a downright blasphemous amount of light!! The S2 features 2 strobe modes, SOS mode, 2 timers, and other “special” modes. I tried a few of them out of curiosity, but it’s just not something I’m really interested in. Strobe has dubious tactical advantages… because it destroys YOUR vision as well. Instant strong light on the other hand, different story. Again, to each their own. This light provides plenty of other cool options for those interested. Just not something I happen to care about. The smaller Olight S1 has been through my washer and dryer with no side issues. It did come out sparkling clean of course. I haven’t tried forgetting the S2 in my jeans or cargo shorts yet, tho I suspect it would fare just the same. I hear the S1 and S2 both also survive 3′ drops to kitchen tile or patio rock with no issues. And this, friends, is why we take gallery photos of review products BEFORE we play with them lol. Now, for the big question: how’s the runtime on those rechargeable batteries? We’ve all seen monster flashlights that burn through their batteries in a matter of minutes… Which makes them a terrible choice for a reliable everyday carry light. Well, the runtime on the S2 is absolutely insane. Partly due to these 18 650 rechargeable batteries which put up more power and hold more juice than the smaller CR123s. I charged the battery when I got the S2, and it ran for SIX WEEKS with my regular daily use. SIX WEEKS!! To be specific, I went with the latest generation Olight S2 18650, 3600 mAh non-protected batteries. They cost a few dollars more, but damn, these batteries are magical. Honestly, I’m puzzled by the lukewarm reception this flashlight has received overall in flashlight forums, etc. It’s an excellent light, especially for everyday carry. I liked the Olight S2 so much that I got another one, and of course another one of those same Olight 18650 3600 mAh batteries. The second one shares the same excellent fit and finish, quality manufacturing, great light output, etc. The S2 continues to apply the same signature features as the Olight S-series flashlights including a low-profile side switch, removable pocket clip, magnetic tail cap, and timer. The S2 is the best choice for users looking for a flashlight that can take an 18650 battery and still have an extremely small form factor. built-in thermal management safety program. Thermal management safety program with overheat protection by dropping high output by 50% within 1 minute of constant on. Turbo mode has a limit of 2 minutes. There’s very little to not like about this flashlight. After a few months of daily EDC, I actually got a second one to keep on hand. It’s that useful. I wish you could go to full power 950 lumens with a single click. Currently, it requires 2 rapid clicks from the off position. In a tactical defense situation, fumbling with multiple button clicks is about as error prone as fumbling with a manual safety on your handgun. The less specific movements required, the better. A second, is an even more minor item. The S2 “remembers” the last mode you selected, so that is the mode you start in with a single click. That’s great, except it refuses to remember the 950 lumen turbo mode or the 0.5 lumen moonlight mode. This is one of those cases of “watching out for me so I don’t have to”, and as a grown man I don’t appreciate it. I find it annoying and borderline offensive. Let the light remember all the modes consistently, as expected, not just some. These are both minor issues, tho I would like to see them corrected in future incarnations of these products. I recently acquired an Olight Mini Intimidator 2 flashlight (review pending – absolutely love it so far). One thing I truly love about that little monster is the easy charging of the 18650 batteries with the included USB charging cable. Perfect for the on-the-go-light. I realize the Olight S2 is already very small for what it is, but tech permitting, I would LOVE to see this feature included in future updates of this already excellent light. I realize the Olight S2 is already very small for what it is, but tech permitting, I would LOVE to see this feature included in future updates of this already excellent light. This light is awesome, I recommend it highly. Get yourself one. You won’t regret it, tho you may end up with more than one as I did.